Working on this block (my March entry in the CQJP 2015) has been like working with sunshine ~ especially since the past two weeks have felt a bit more like what I imagine Portland or Seattle to be like! 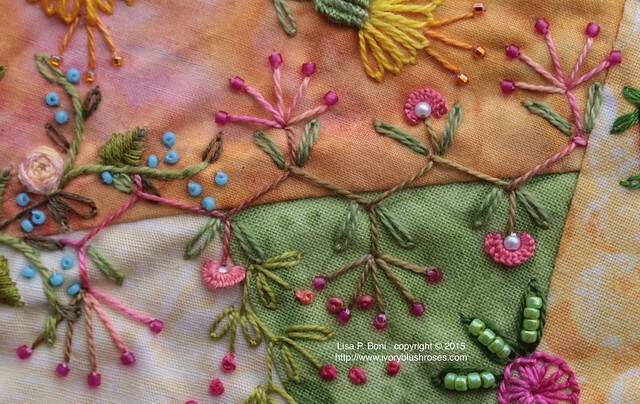 The warm, bright colors have truly been a lift to my spirits on so many dark grey days! Here's a little tour around the block. 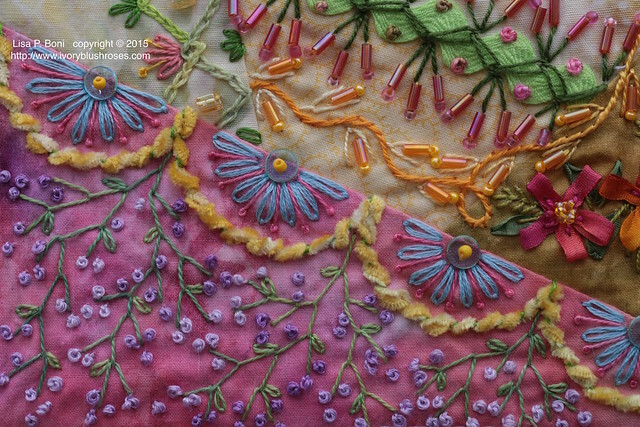 In the lower left, I couched some sunny silk chenille with green thread and added some blue and pink flowers. 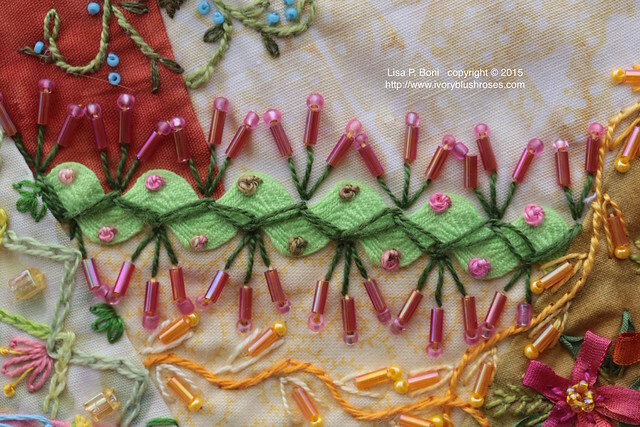 Feather stitching and french knots fills the rest of the block. 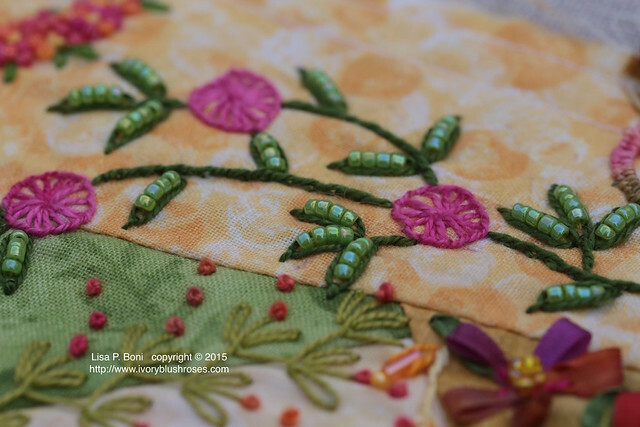 In the upper portion of the block I added these golden flowers with bullion stitched receptacles and back split stitch stems. It seems that I'm adding a bit of rickrack to every block. 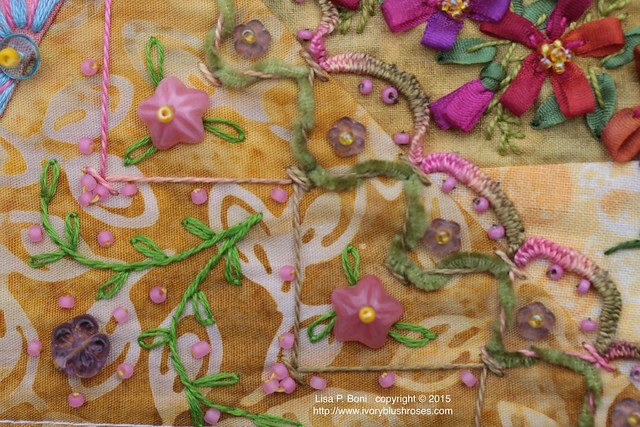 This one got a bit of bright green rickrack, toned down by adding some darker green stitching and pink beads and french knots. This is one of my favorite seams ~ one I'll have to repeat where it can better be viewed. Love the effect of the little cast on flowers. Had to have a nice feather stitch seam and so I used this one that's become a favorite of mine. I've used it on several projects! I love making spider web roses with embroidery floss, especially a nice variegated one! Tiny turquoise beads add a dash of blue. 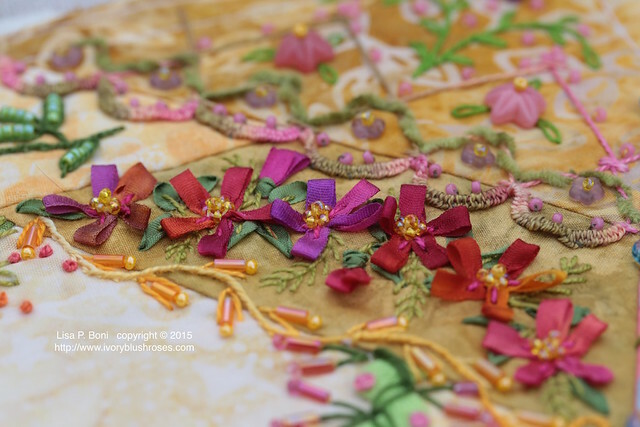 On an ugly green/gold patch, I used some silk ribbon flowers to liven it up and bring the block into balance with the other blocks I've stitched so far. 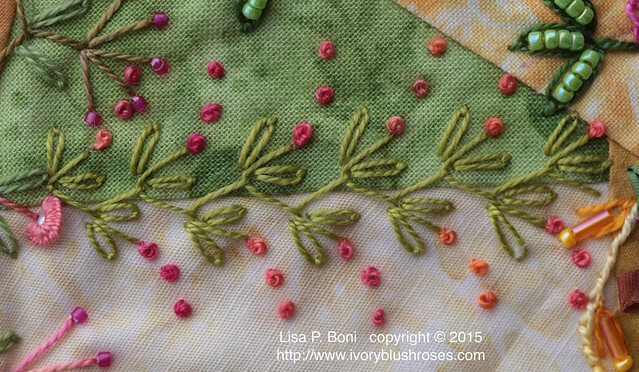 In one corner, I added some swags of french knots accented by a large green bead. Found a spot to use some of those square beads! 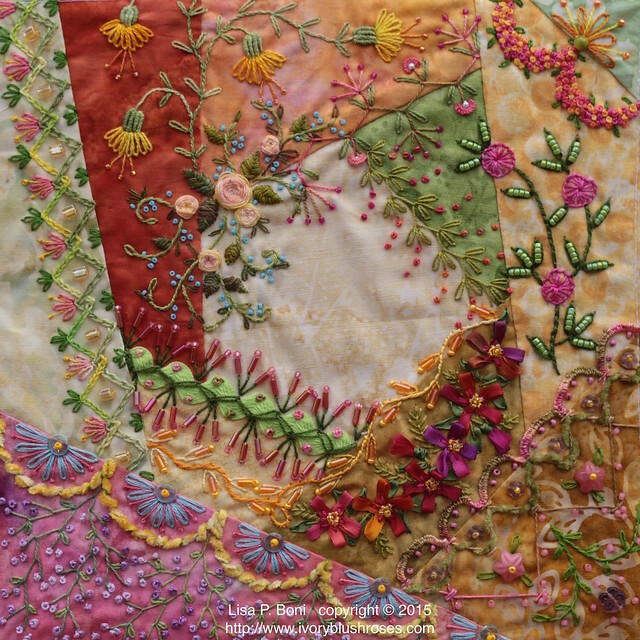 Love the sparkle and dimension that they add to this chain stitched seam! 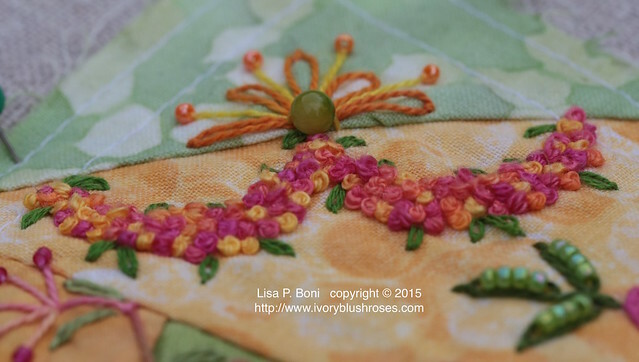 Buttonhole flowers and beaded leaves create this floral spray. My favorite part of the block! And my least favorite part of the block. If I hadn't stitched that woven chenille down so thoroughly, I'd probably rip this corner out and do it all over again. I like the cast on scallops, but the rest of the chevron stitching was too large and the thread color gets lost in the fabric. When looking at the block as a whole, it does work though, so I've decided to leave it as is. Finally getting those bullion stitches down! So happy with this part of the block! Here are my three blocks for the CQJP 2015 together. So far, I think they are balancing out with one another ok. I'm starting to think about how I will be putting the blocks all together at the end of the year. Debating some pink/yellow batik fabric for sashing between them! WOW! What wonderful inspiration for my eyes to see this morning. I think your March block is my favorite. Thank you for the close-up views and telling about your stitches. 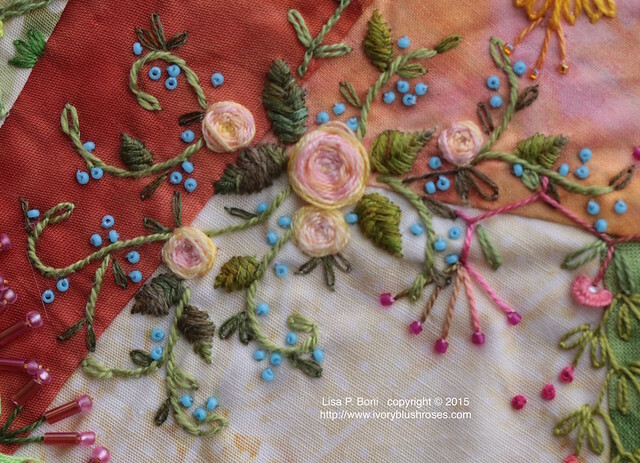 I love your spiderweb rose section of block, and the cast on stitching looks great too. I like the rick rack also and plan to get some soon. Is there a website or video that shows how to hand piece/sew crazy block squares? 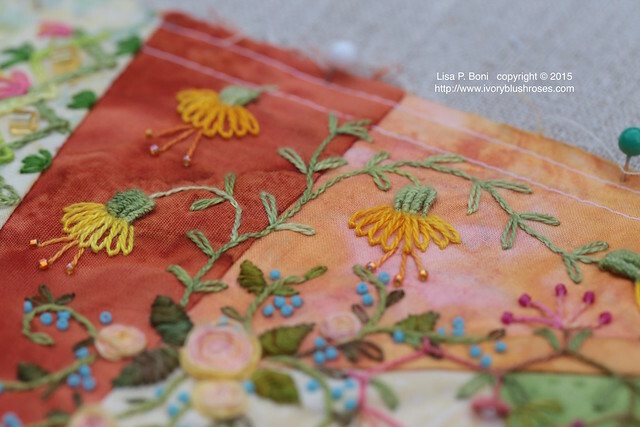 I don't use a sewing machine and really want to try my hand at crazy-quilting. Love the colors and your sticking is impeccable! Wow, this just makes my heart sing Lisa! Stunning. 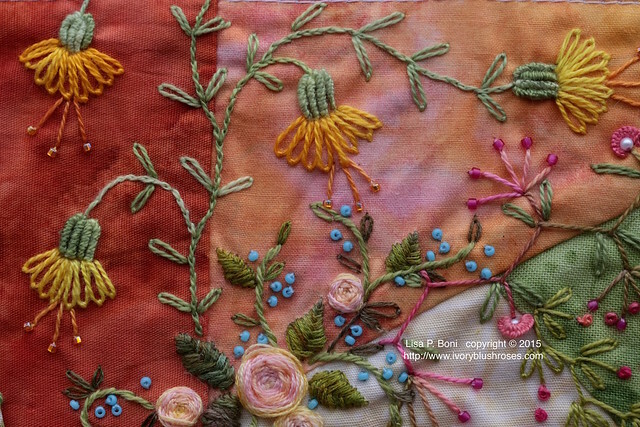 I love the colors and the variety of stitches. I cracked up on your comment about the weather in Portland, yes, it is cloudy right now, but it's not always like this. Have a blessed Sunday. Thank you for sharing your gift. Your work is breathtaking, as always. The colors in these blocks just knock me out, vibrant without being garish, and gorgeously compatible. 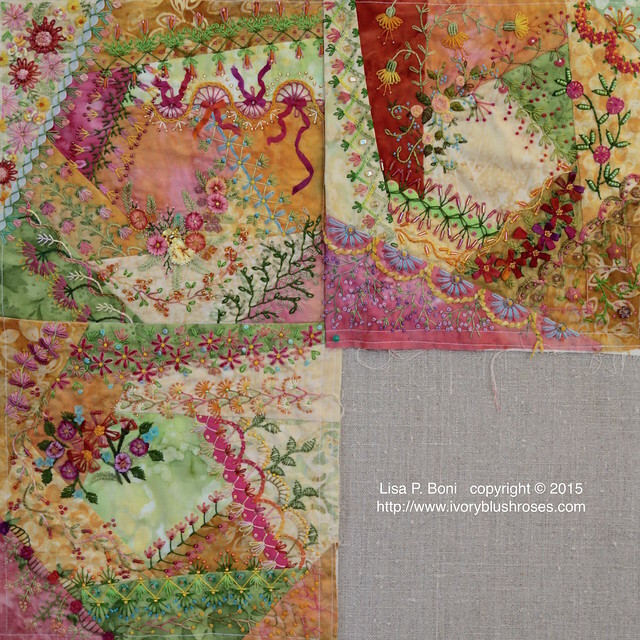 If I ever get back into crazy quilting, your work will be my inspiration. 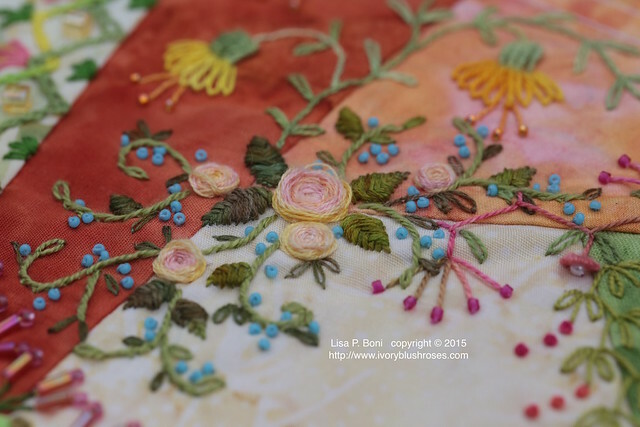 I've put down crazy quilting for many years since my Mom died. Revisiting old blogs for the first time in many years and your work is as stunning as ever. Your work is so scrumptious! Love the colors and patterns. BTW, I'm passing a One Lovely Blog award to you and hope some new readers find your wonderful blog. Wishing you all the best. just found your blog what wonderful designed blocks. I will certainly be back. Lisa this is beautiful! Thank-you for breaking down the block and the review of your stitches. It's absolutely amazing!! I've missed so much from not being able to access my blog, but am elated I once again get to enjoy your beautiful work!! I've just found you via Ann at Fret Not Yourself. Your blocks are exquisite!